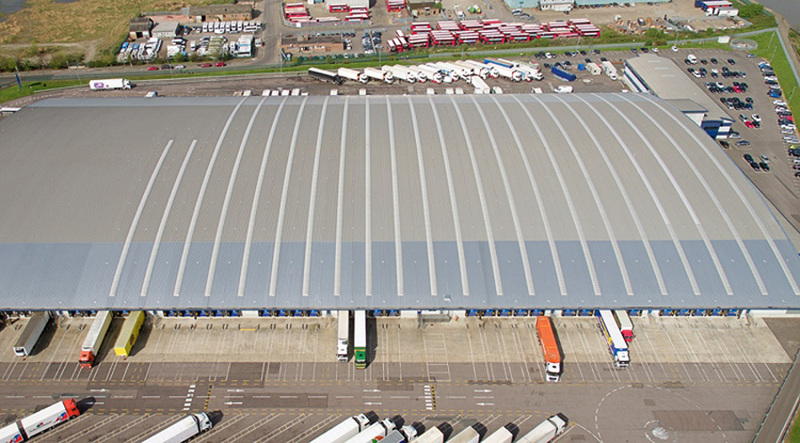 LIDL Distribution CentreStaffordshire-based Ascot Property Maintenance Ltd, installed over 2600 linear metres of Filon’s Monarch F 1200mm wide triple skin barrel vault rooflights at this regional Distribution Centre serving South-East England. The installation was part of a major refurbishment in which Ascot Property Maintenance also replaced over 10,000m2 of the aluminium roof. The rooflights were specified with a CEDR24E outer skin. This is a double reinforced translucent GRP sheet nominally 2.4kg/m2 providing excellent strength characteristics. When tested in accordance with non-fragility drop test ACR[M]001:2014 it provides a class B non-fragility rating for an expected period of 25 years. The triple skin construction of these rooflights provides a U value of 1.7 W/m2K – meeting the stringent thermal performance requirements for the building. On one section of the roof the barrel vaults were supplied in opaque grey GRP, with a white internal finish, to maintain the correct conditions for ambient storage of chocolate products. The longest rooflights installed on this huge curved roof are over 118m long: among the longest uninterrupted runs ever supplied by Filon Products.